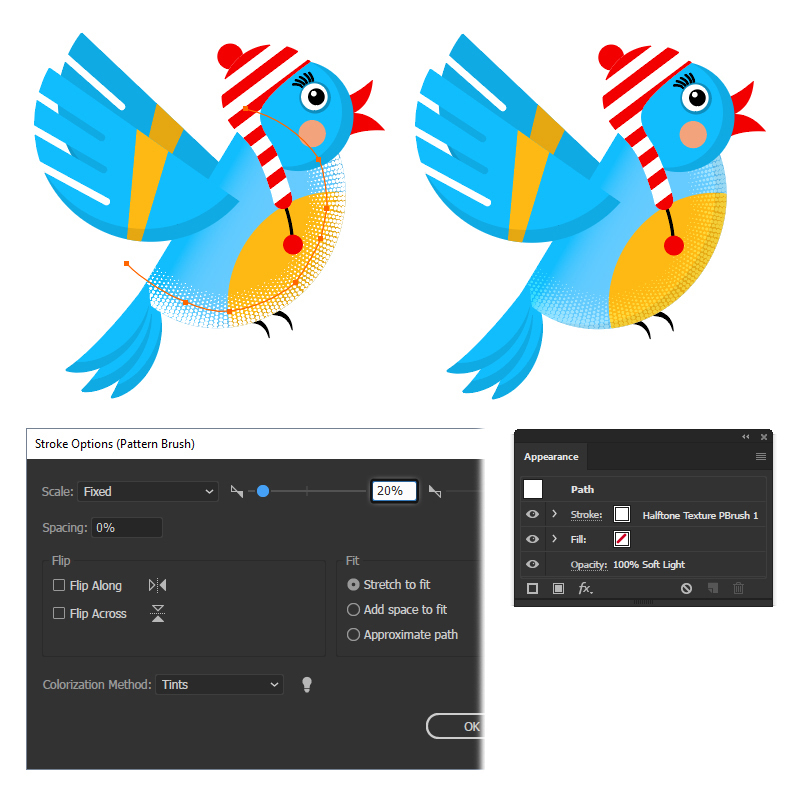 In this new tutorial you will learn how to create a bird character with textures in Adobe Illustrator. 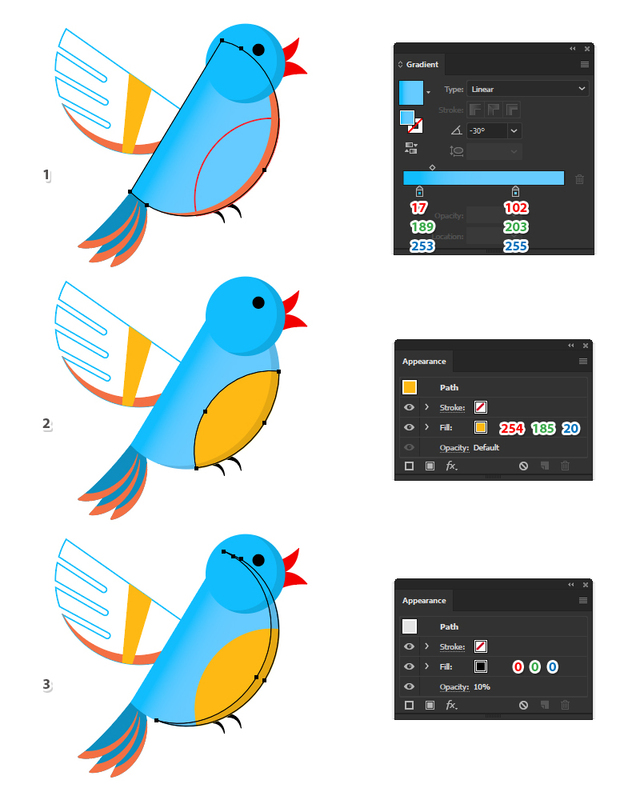 Follow this tutorial and learn how to draw a cute bird character that we are going to level up by adding plenty of different textures and details on it. 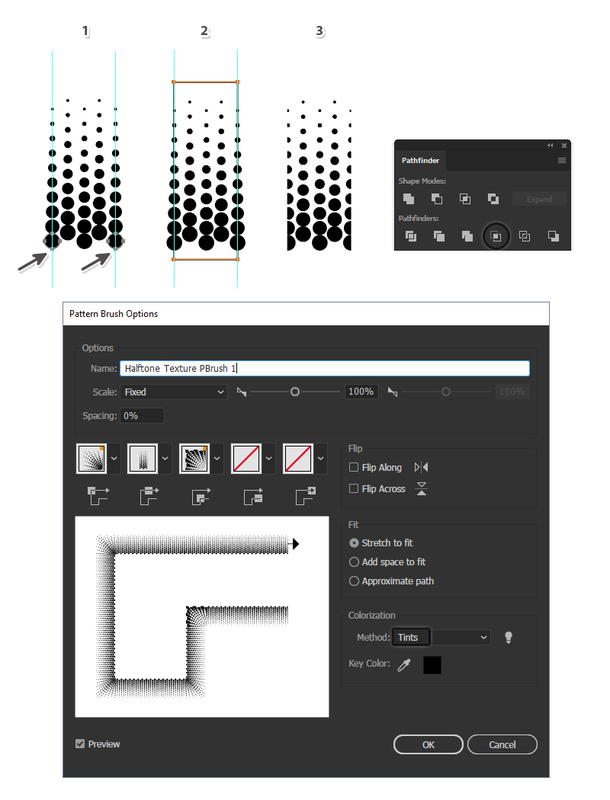 For this, we are going to create and save custom Pattern and Scatter Brushes and use them throughout the tutorial. By the end, you will be able to apply these techniques in other illustrations in your future projects. Let’s start! 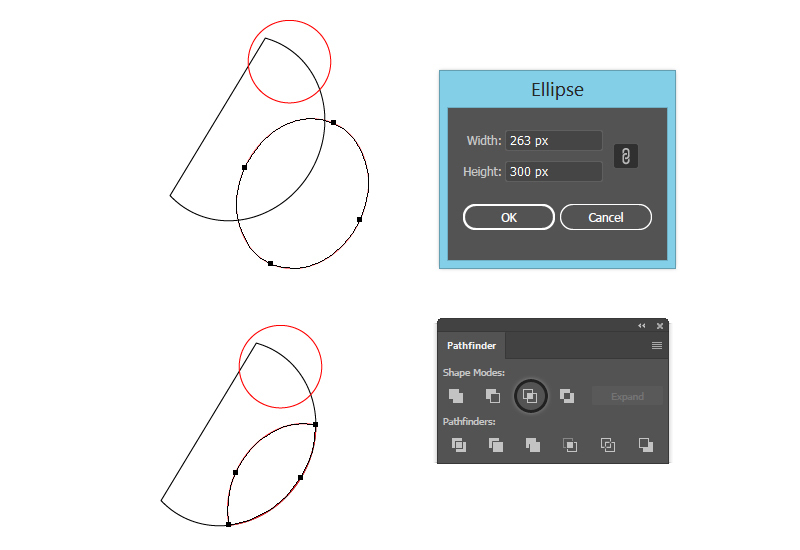 First, grab the Ellipse Tool (L) and draw an ellipse of 380 x 345 px on your artboard. Switch to the Rectangle Tool (M) and draw a 470 x 160 px rectangle; then place it at the top of the ellipse as shown in the image below. While both shapes stay selected, press Minus Front in the Pathfinder panel. Rotate the shape obtained in the previous step as shown and this will be the body of the bird. 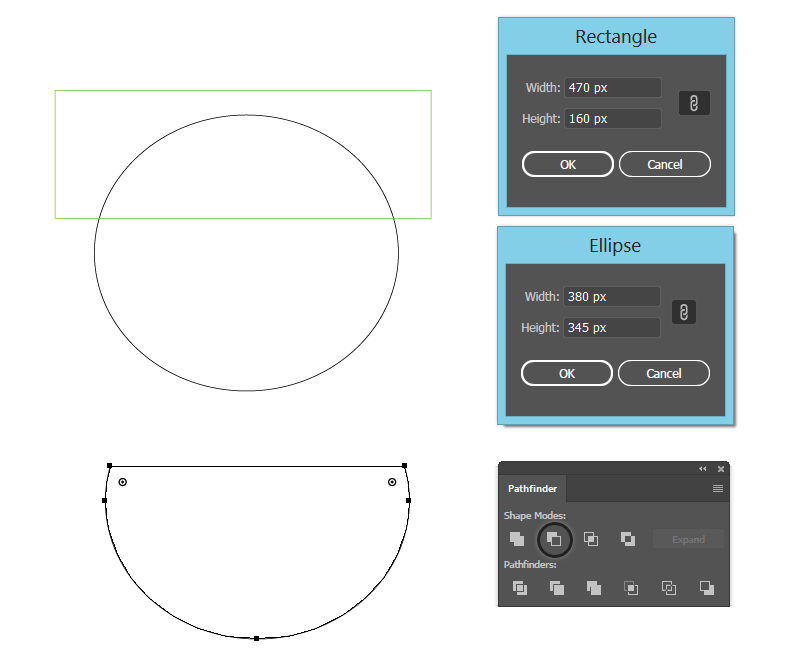 Draw a new 165 x 165 px circle with the Ellipse Tool (L) as the head. Let’s continue with the belly. 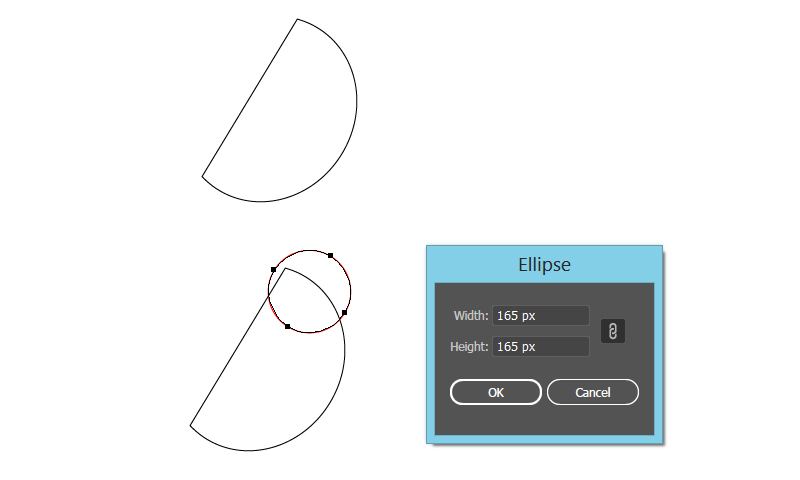 Take the Ellipse Tool (L) and draw a 263 x 300 px ellipse; then rotate and arrange it over the body. Now, select the shape of the body and then Copy and Paste in Front (Control-F) to make a copy of it. While this copy stays selected, also select the ellipse and then press Intersect in the Pathfinder panel. You will obtain the shape of the belly. 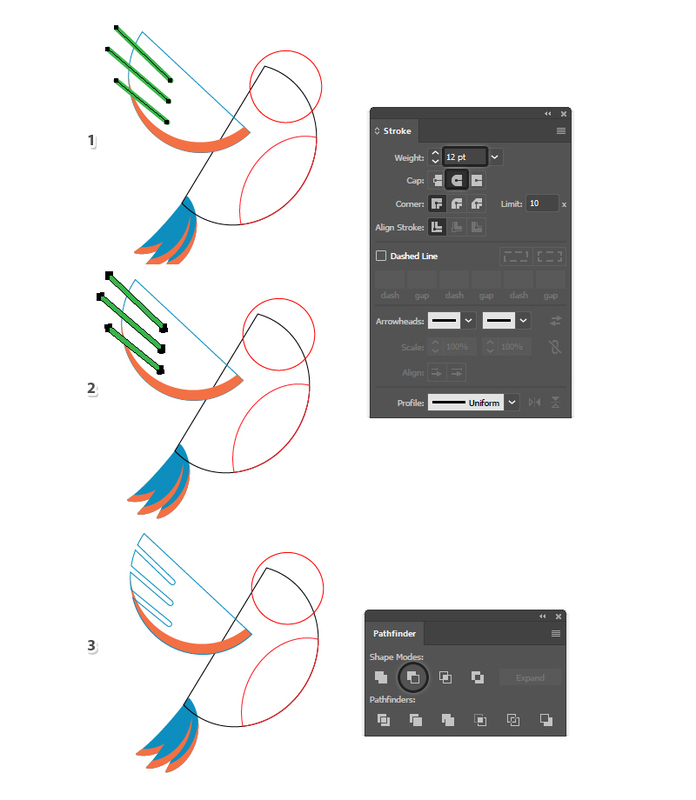 To create the tail of the bird, use the Pen Tool (P) to draw a slightly curved path at the end of the body (1). Give it a 40 pt Stroke, press the Round Cap option and choose the Width Profile 6 in the Stroke panel (2). After you are done, go to Object > Expand in order to turn the stroke into a filled shape (3). Copy and Paste in Front (Control-F) the blue tail shape obtained in the previous step and move it a little upwards and a little to the right using the Arrow keys on your keyboard. For visual purposes, I’ve changed the fill color to orange (1). 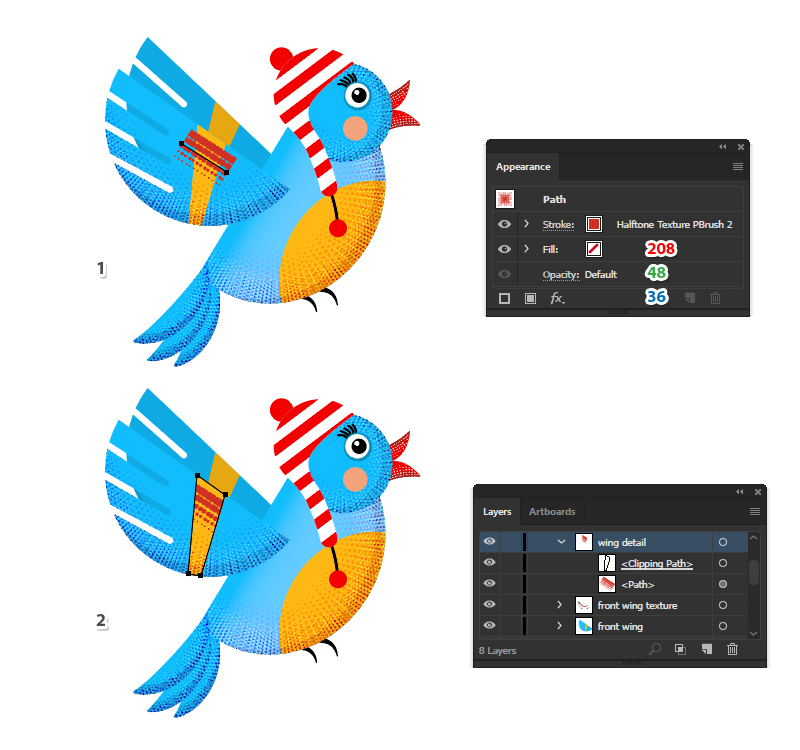 Select the blue tail shape and then Copy and Paste in Front (Control-F) to make a copy of it. While this copy stays selected, also select the orange shape and then press Minus Front in the Pathfinder panel. You will obtain an orange edge (2). Group (Control-G) the blue tail shape and the orange edge and after that, make two copies of this group. 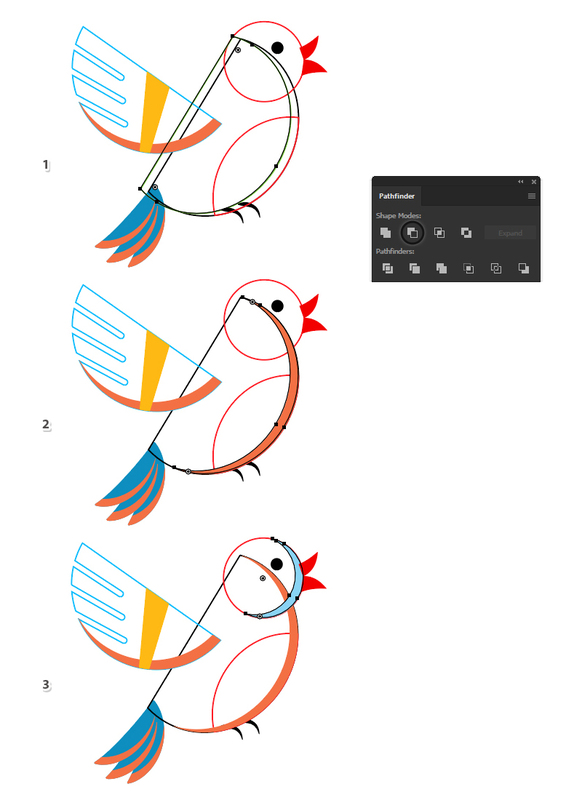 Rotate and arrange them like in the image below to compose the entire tail of the bird (3). We will continue with the wing. 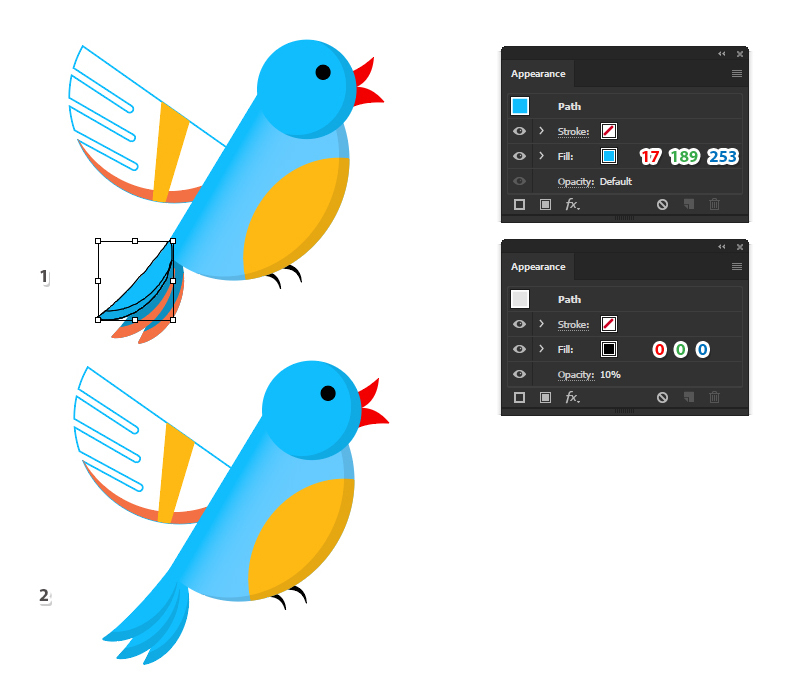 Draw a half circle with the Pen Tool (P) or use the technique explained for the body of the bird to obtain this shape and then rotate and arrange it as the wing (1). Copy and Paste in Front (Control-F) the wing shape and move it a little upwards and to the left using the Arrow keys on your keyboard (2). Now, Copy and Paste in Front (Control-F) the original wing again and while this copy stays selected, also select the moved wing and press Minus Front in the Pathfinder panel. You will obtain the orange edge at the bottom of the wing (3). 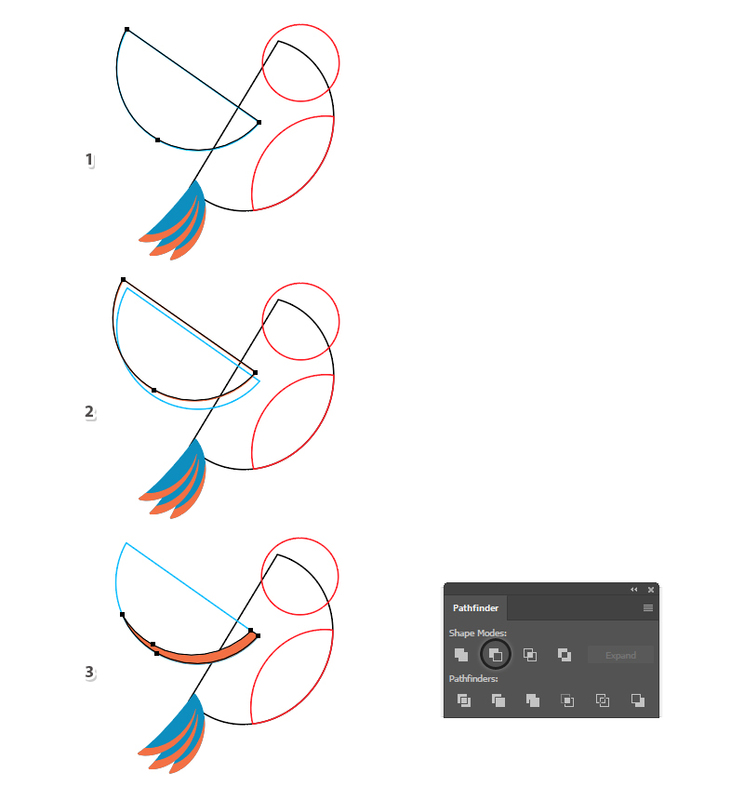 Use the Pen Tool (P) or the Line Segment Tool (\) to draw three paths over the wings as shown in the image below. Give them a 12 pt Stroke and press the Round Cap option in the Stroke panel to obtain the rounded ends (1). Go to Object > Expand to turn the strokes into filled shapes; then go to Object > Compound Path > Make (Control-8) to merge them into a single compound path (2). Now, select the wing shape along with the stripes and press Minus Front in the Pathfinder panel to subtract them from the wing (3). 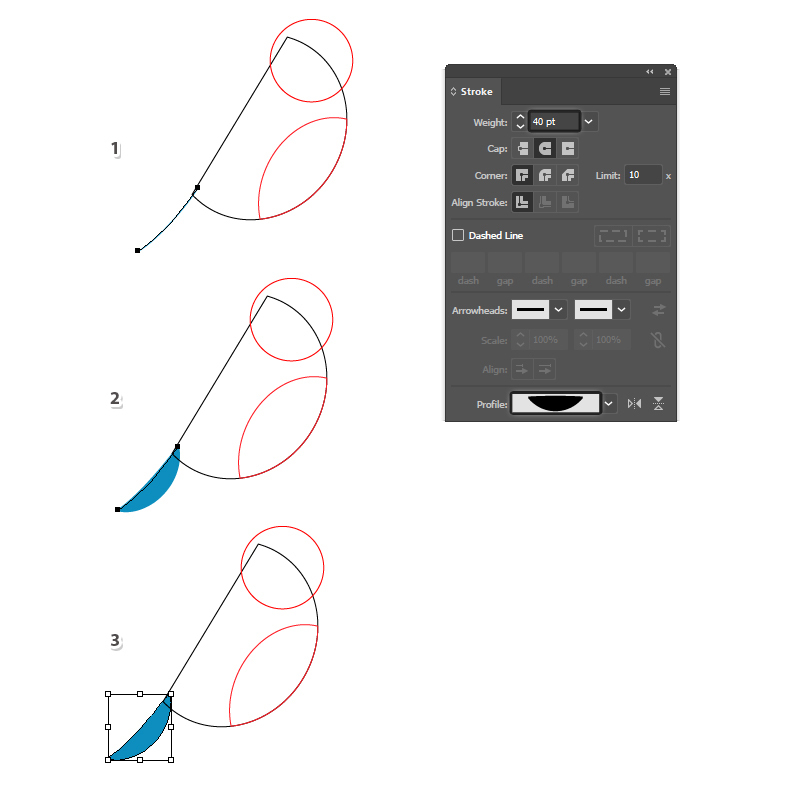 Use the Pen Tool (P) to draw an irregular stripe over the wing. 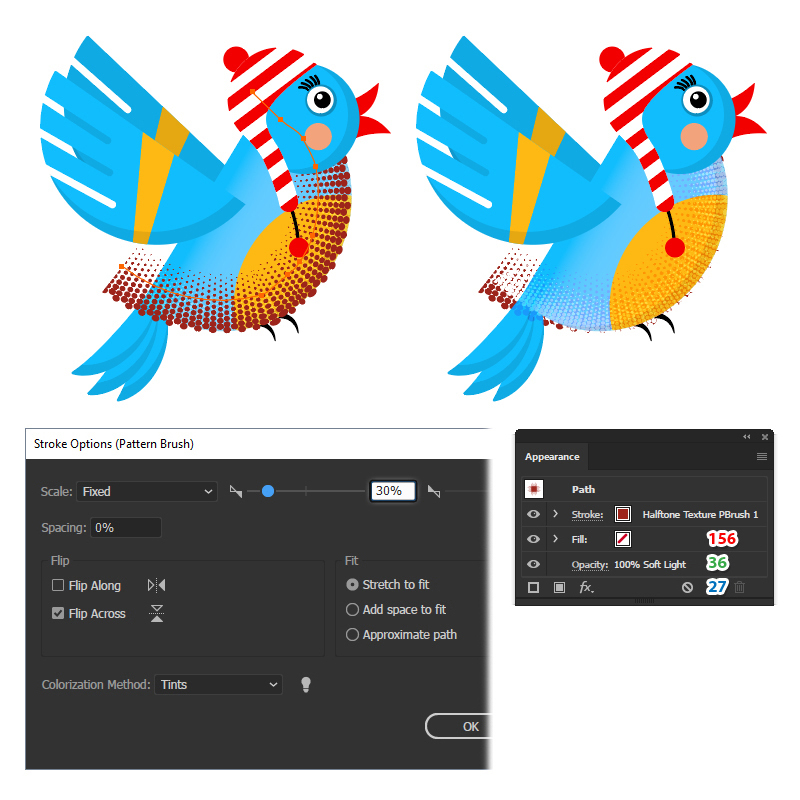 Make a copy in front of the wing; then select the stripe along with the copy of the wing and press Intersect in the Pathfinder panel. Color the resulting shape with yellow. Focus on the head of the bird and draw a small black circle as the eye (1). 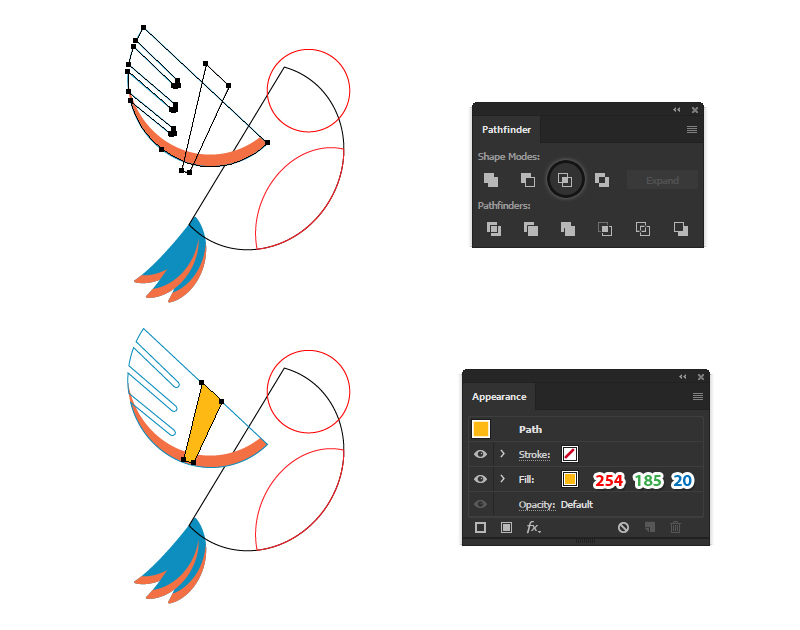 Next, draw the top shape of the beak using the Pen Tool (P) and after you are done, you can reflect it horizontally to obtain the bottom shape of the beak. Color them with red (2). For the feet, draw two curved paths with the Pen Tool (P) at the bottom of the belly. Give them an 8 pt Stroke and use the Width Profile 5 in the Stroke panel (3). Select the body shape and then Copy and Paste in Front (Control-F) to make a copy of it. Move this copy a little upwards and to the left (1). Make another copy in front of the original body and while this copy stays selected, also select the moved shape and press Minus Front in the Pathfinder panel. You will obtain the orange edge in the right side of the belly (2). 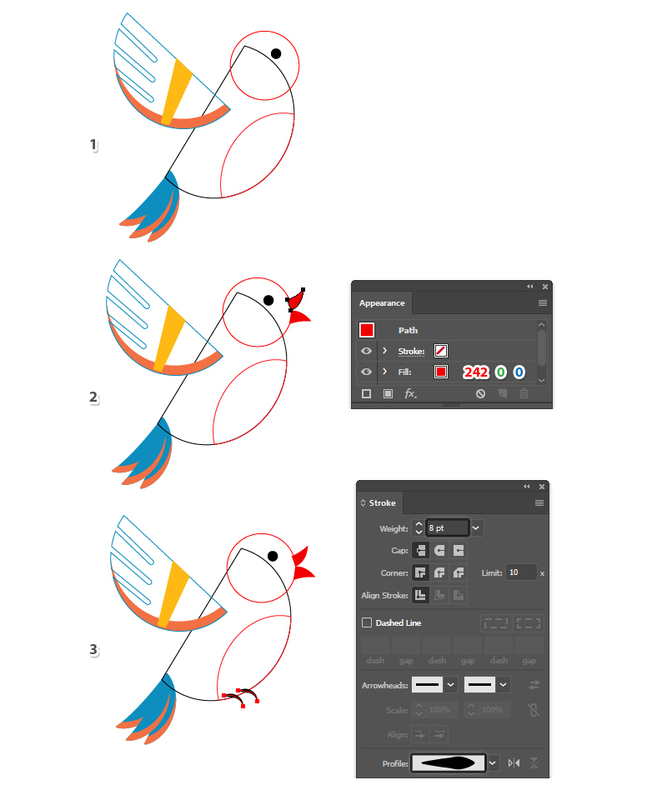 Use the same technique to obtain the blue edge on the head of the bird (3). At this point the bird is pretty much complete and we can continue with the coloring. Fill the head with a bright blue and the edge shape with black at 10% Opacity. This will create shading in the right side of the head. Fill the shape of the body with the linear gradient shown at a -30 degrees Angle (1), the belly with yellow and the edge shape with black at 10% Opacity in order to create shading (3). 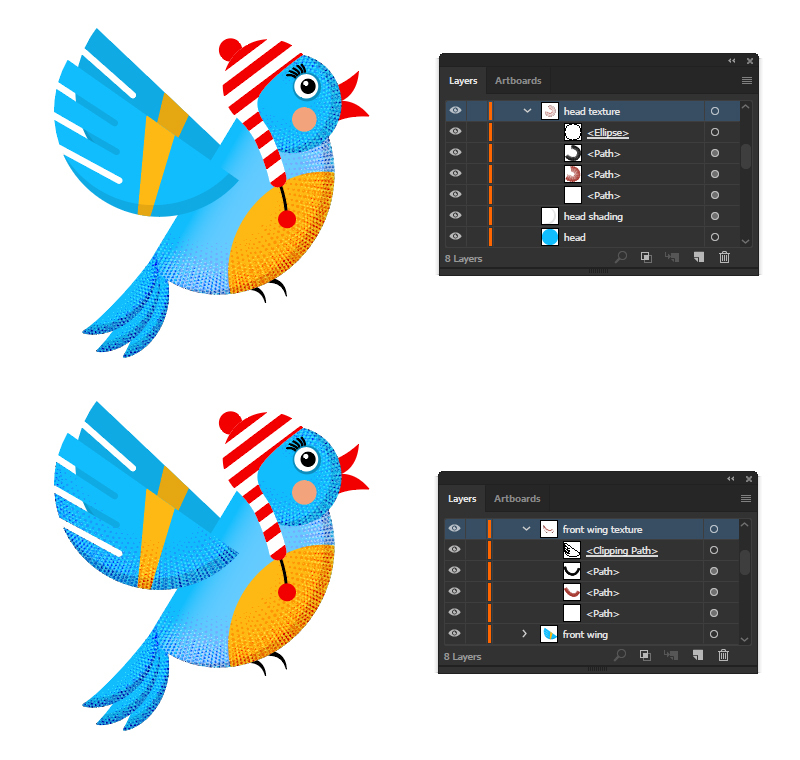 Fill the tail shape with the same bright blue and the orange edge with black at 10% Opacity as you did before (1). Color the other two groups that compose the tail with the same colors (2). 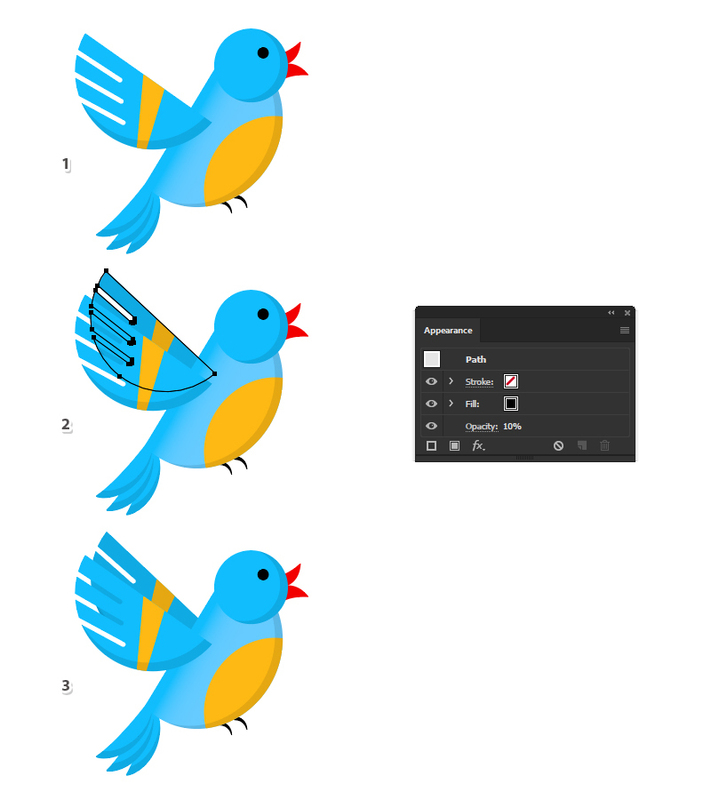 Use the same colors for the wing; then make a copy of it in back and slightly rotate it so the two wings don’t overlap. 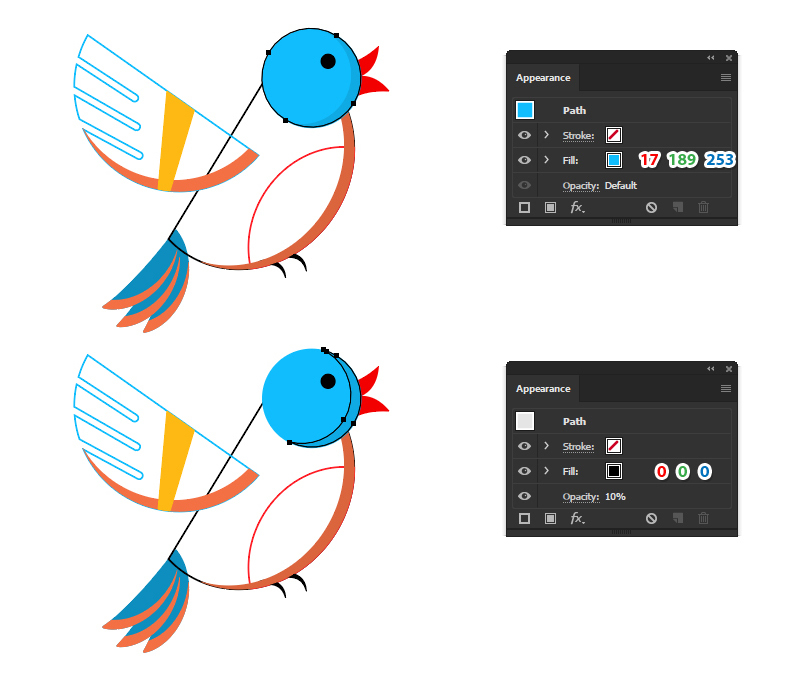 Copy and Paste in Front (Control-F) the back wing shape and change the fill color to black at 10% Opacity to create shading (2). We will continue with the hat. Use the Ellipse Tool (L) to draw a 152 x 148 px ellipse (1). Switch to the Direct Selection Tool (A) and use it to select only the bottom point and press the Delete key on your keyboard. Now, select the two end points of the resulting path and press Control-J which is the shortcut for Join. This will close the path and you will get a half circle. Take the Pen Tool (P) and draw a slightly waved path in the bottom left side. Give it a 28 pt Stroke and press the Round Cap option in the Stroke panel (2). Go to Object > Expand to turn the stroke into a filled shape (3); then select the resulting shape along with the half circle and press Unite in the Pathfinder panel to merge them into a single shape (4). Use the Pen Tool (P) or the Line Segment Tool (\) to draw a few paths over the shape of the hat and give them a 16 pt Stroke (1). While all the paths stay selected, go to Object > Expand to turn the strokes into filled shapes followed by Object > Compound Path > Make (Control-8) to merge them into a compound path (2). Now, select the hat shape and Copy and Paste in Front (Control-F) to make a copy of it. 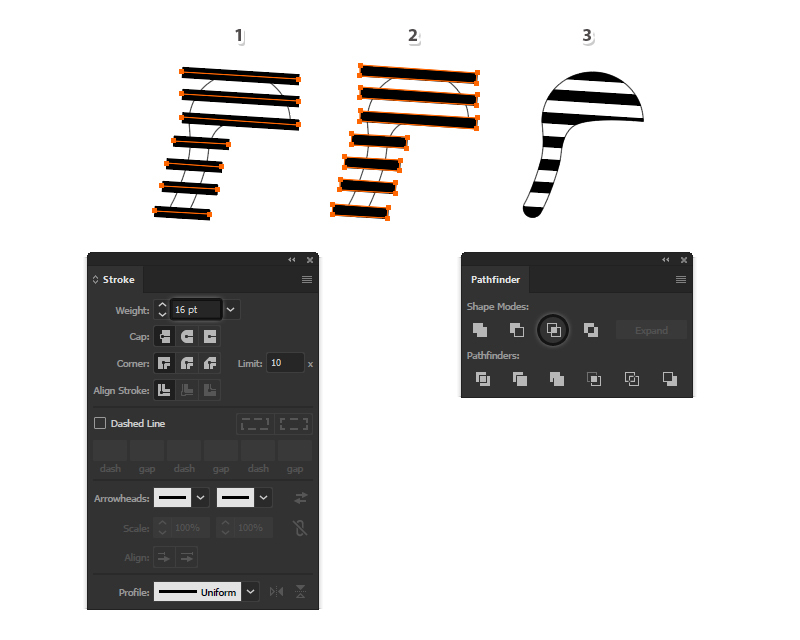 While this copy stays selected, also select the stripes and press Intersect in the Pathfinder panel (3). To complete the hat, draw a small circle at the top as the pom; then draw a path having a 4 pt Stroke at the bottom end followed by another circle as the second pom. Group (Control-G) all the shapes that make up the hat; then rotate and arrange it on the head of the bird. 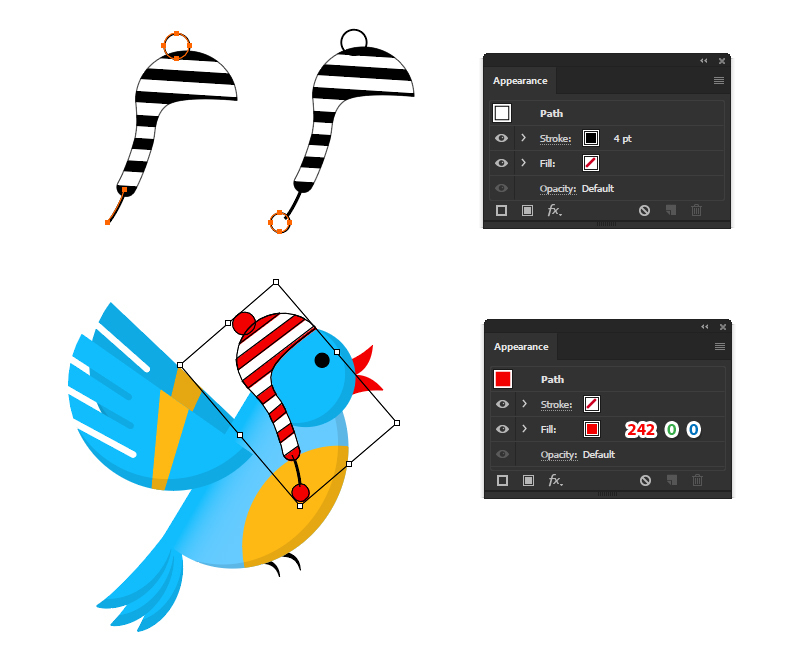 Color the shape of the hat with white and the stripes and poms with red. Let’s focus on the eye. Draw a white circle of about 40 x 40 px and send it behind the black pupil (1). Draw a slightly bigger ellipse filled with a darker shade of blue and send it in the back as well (2). To add a sparkle in the eye, draw a small white circle of about 8 x 8 px in the top left side of the pupil (3). Finally, draw five paths as the eyelashes and give them a 3 pt Stroke (4). The final thing to add is a pink 40 x 40 px circle on the cheek and at this point the coloring part is done. We will continue with the different textures that we’re going to apply to enhance the look of the bird. Use the Ellipse Tool (L) to draw a small 30 x 30 px circle filled with black. Draw another circle right above it of about 27 x 27 px and then a third circle of about 24.5 x 24.5 px. Continue to draw smaller and smaller circles until the last one is 5 x 5 px and you have ten circles in total. Select the column of circles that you have made in the previous step and first, make sure they are aligned by pressing Horizontal Align Center in the Align panel. Group (Control-G) all these circles and make a copy of the group to get the second column. Move it a little to the right (1). Make another copy of the column of circles and move it even more to the right (2). Make a copy of the first column again and arrange it between the first two but slightly higher (3). Do the same thing between the last two columns (4). Now, drag two guide lines from the Rulers (View > Rulers > Show Rulers) up to the bottom points of the first and last circles which will go through the middle of the entire column (1). Use these two guides as reference and draw a rectangle between them as shown below (2). Now, select all the circles and Group (Control-G) them. While the group stays selected, also select the rectangle and press Crop in the Pathfinder panel (3). 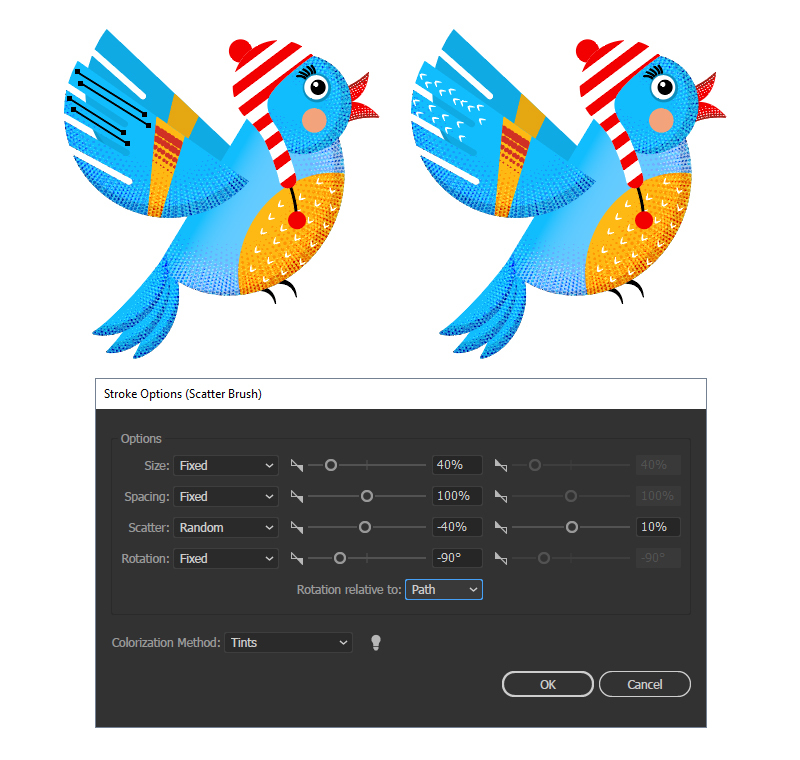 Drag the resulting group into the Brushes panel and choose New Pattern Brush. Type “Halftone Texture Pattern Brush 1” as the name and select Tints as the Colorization Method. Hit OK to save the new custom brush. Let’s apply the newly saved brush. Grab the Pen Tool (P) and draw a path following the right edge of the body like in the next image. 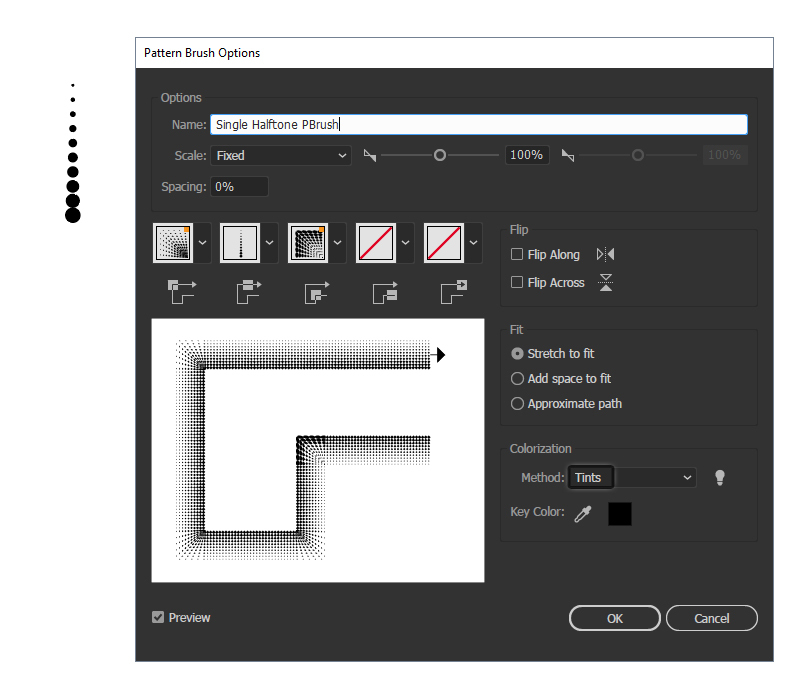 Give it a 1 pt white Stroke and then select the “Halftone Texture Pattern Brush 1” from the Brushes panel. 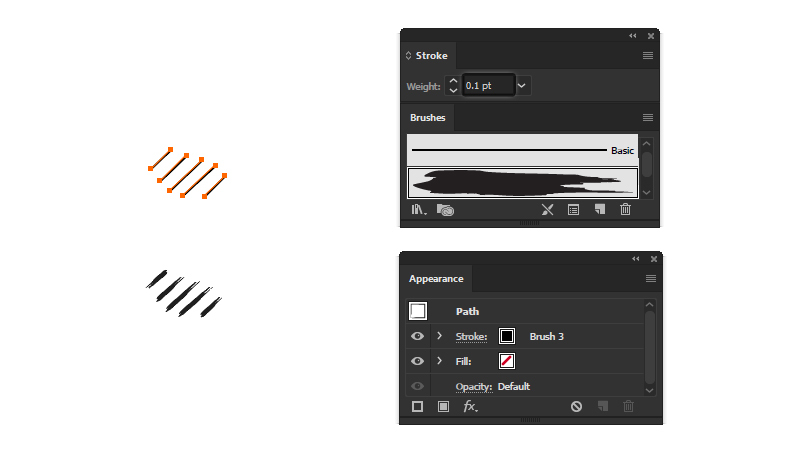 Open the Stroke Options window from the Appearance panel and type 20% in the Scale field to make the brush smaller. Hit OK. Set the Blending Mode to Soft Light. 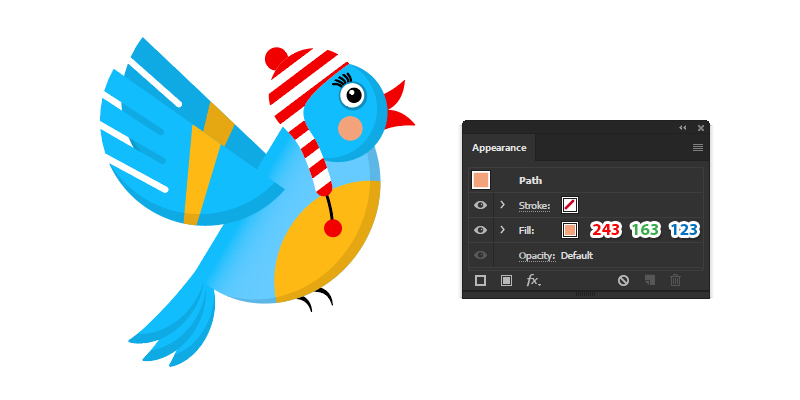 Draw another path over the body of the bird using the Pen Tool (P). Give it a 1 pt dark red Stroke and use the “Halftone Texture Pattern Brush 1” again. This time, scale the brush to 30% and also check Flip Across in the Stroke Options window. Hit OK and then set the Blending Mode to Soft Light. Draw a third path right next to the edge of the belly and give it a 1 pt black Stroke. Use the “Halftone Texture Pattern Brush 1” again and this time, scale it to 20% in the Stroke Options window. Set the Blending Mode to Overlay. Now we need to create a mask. Copy and Paste in Place (Shift-Control-V) the shape of the body and remove all existing appearances. 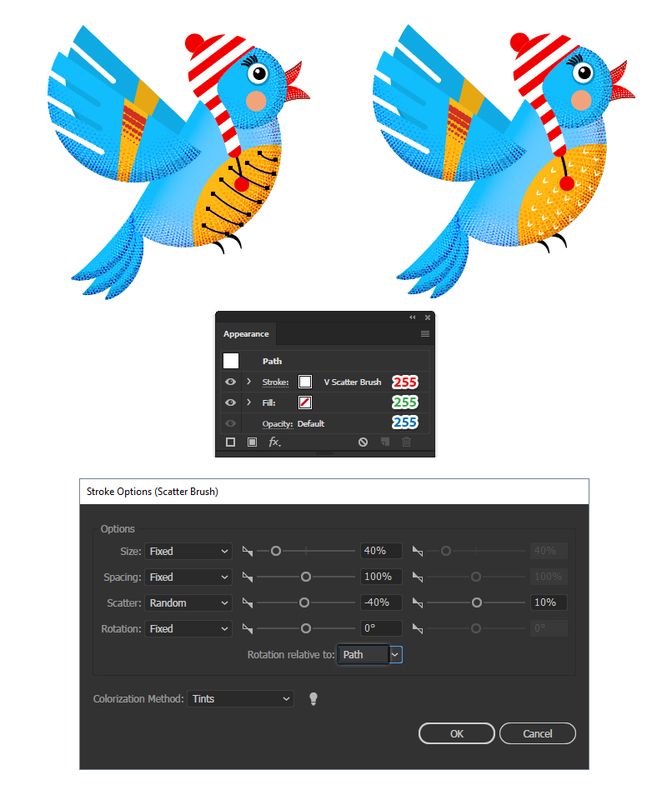 Select the three stroked paths along with the copy of the body and go to Object > Clipping Mask > Make (Control-7). Name the resulting group “body texture”. Follow the technique explained above and create the three stroked paths over the first piece of the tail. Use the same brush and apply the exact same settings (1). After you are done, create a mask using a copy of that piece of tail (2). Repeat the same thing for the other two pieces of tail and you can see the final result in the image below (3). 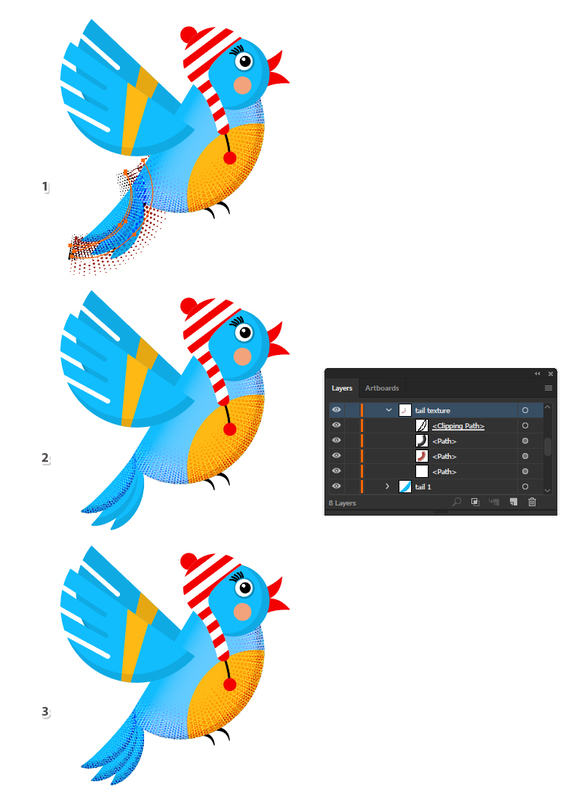 Use the same technique to add texture on the head of the bird and then continue with the wing. Grab a copy of just one column of circles from the first brush that we have created and drag it into the Brushes panel to save it as a New Pattern Brush. Type “Single Halftone Pattern Brush” as the name, select Tints as the Colorization Method and hit OK.
Let’s create another brush. 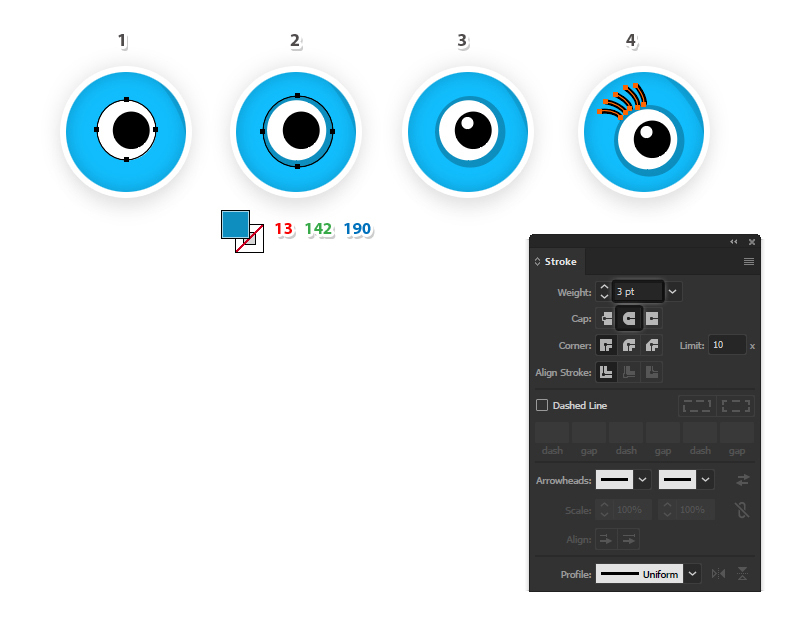 Use the Ellipse Tool (L) to draw five circles of different sizes starting from 25 x 25 px up to 5 x 5 px. Make sure that they are aligned by pressing Horizontal Align Center in the Align panel and then Group (Control-G) them (1). Make a copy of the group of circles and move it to the right a little but they should still overlap (2). Continue to make more copies of the same group of circles and arrange them as shown (3-4). Drag two guide lines from the Rulers up to the bottom points of the first and last circles which should go through the middle of the entire column (5). Use these guides as reference and draw a rectangle between them (6). Now, Group (Control-G) all the circles and select them along with the rectangle and press Crop in the Pathfinder panel (7). 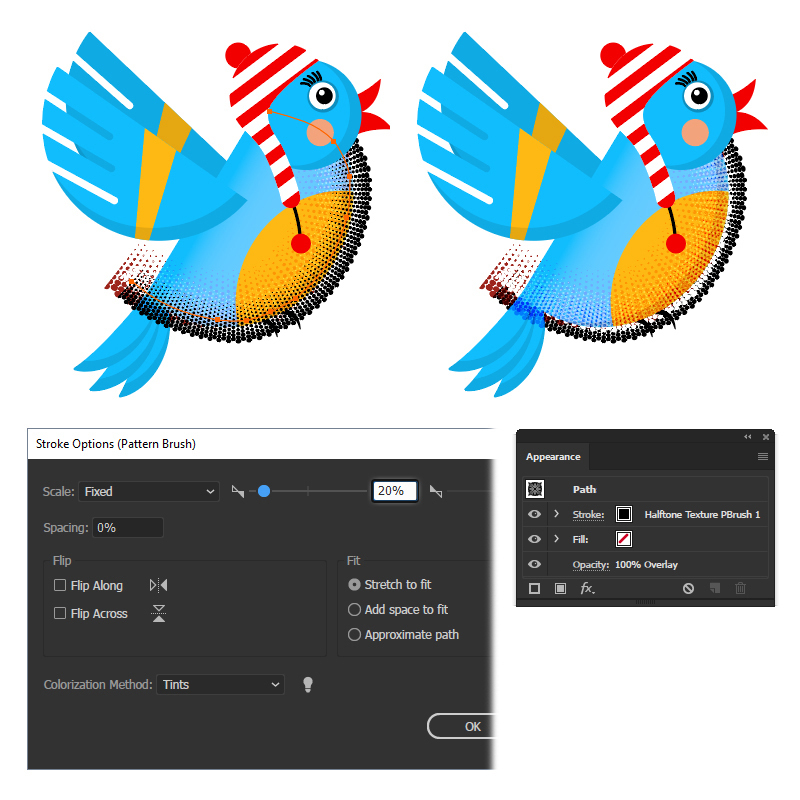 Drag the resulting group into the Brushes panel to save it as a New Pattern Brush. 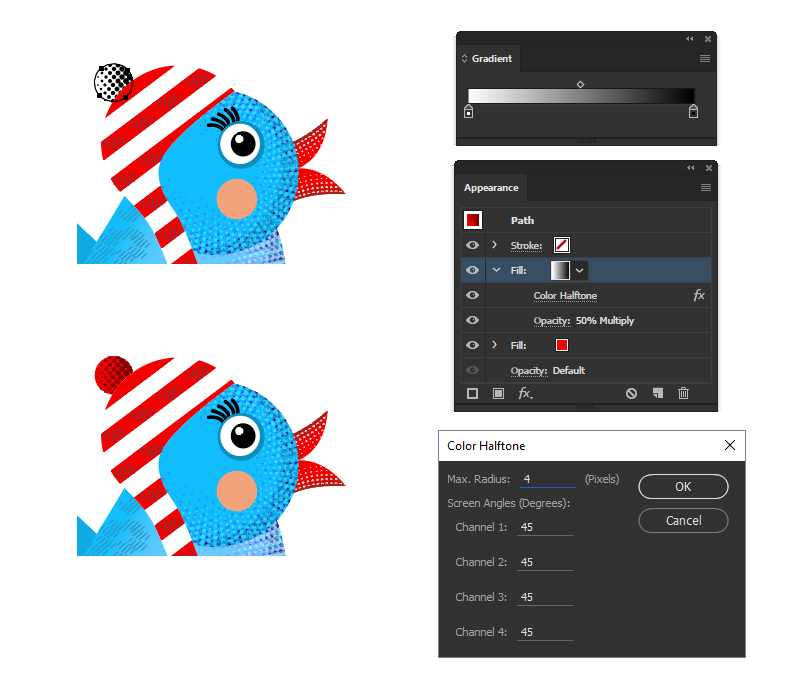 Type “Halftone Texture Pattern Brush 2” as the name and choose Tints as the Colorization Method. Hit OK.
Let’s get back to the bird and focus on the beak. Use the Pen Tool (P) to draw a path following the bottom edge and give it a 1 pt pale pink Stroke using the “Single Halftone Pattern Brush” saved earlier. 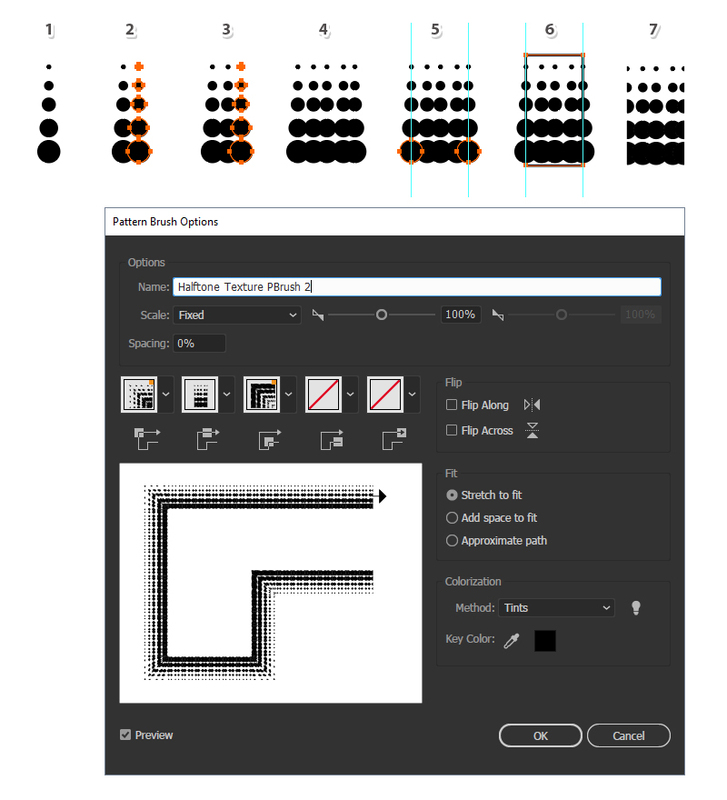 Open the Stroke Options window from the Appearance panel and type 15% in the Scale field to make the brush smaller. Hit OK. Copy and Paste in Front (Control-F) the path from the previous step and remove the existing appearances. Give it a 1 pt dark red Stroke and use the “Halftone Texture Pattern Brush 2” this time. Scale the brush to 20% in the Stroke Options window and hit OK. Copy and Paste in Place (Shift-Control-V) the bottom piece of the beak and set it to stroke-none and fill-none. 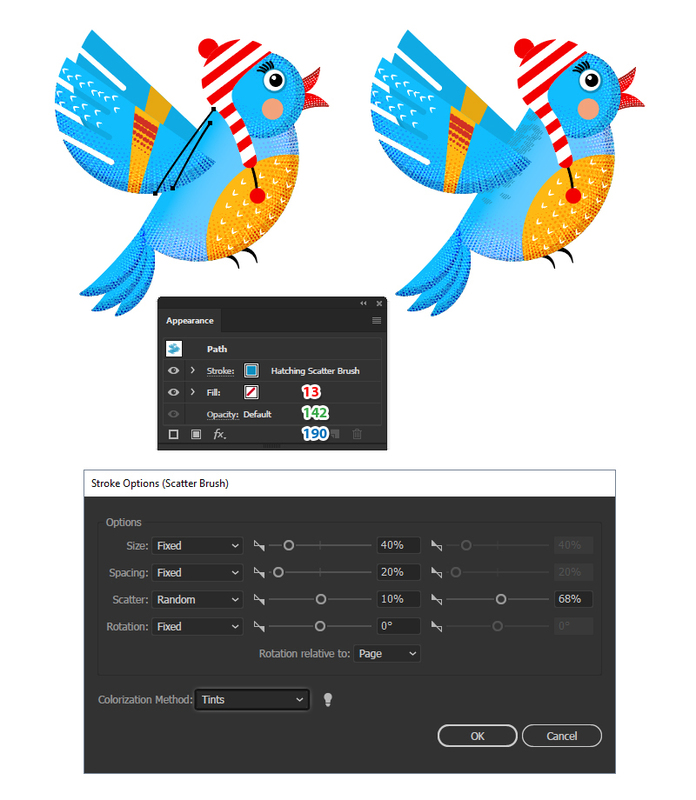 While this copy stays selected, also select the two stoked paths and go to Object > Clipping Mask > Make (Control-7) (1). Repeat the same thing for the top piece of the beak and create the same texture (2). Focus on the wing and draw a path over the yellow stripe like in the image below (1). Give it a 0.5 pt dark red Stroke and use the “Halftone Texture Pattern Brush 2” (1). Select the yellow stripe and then Copy and Paste in Place (Shift-Control-V) to make a copy of it in front of everything. 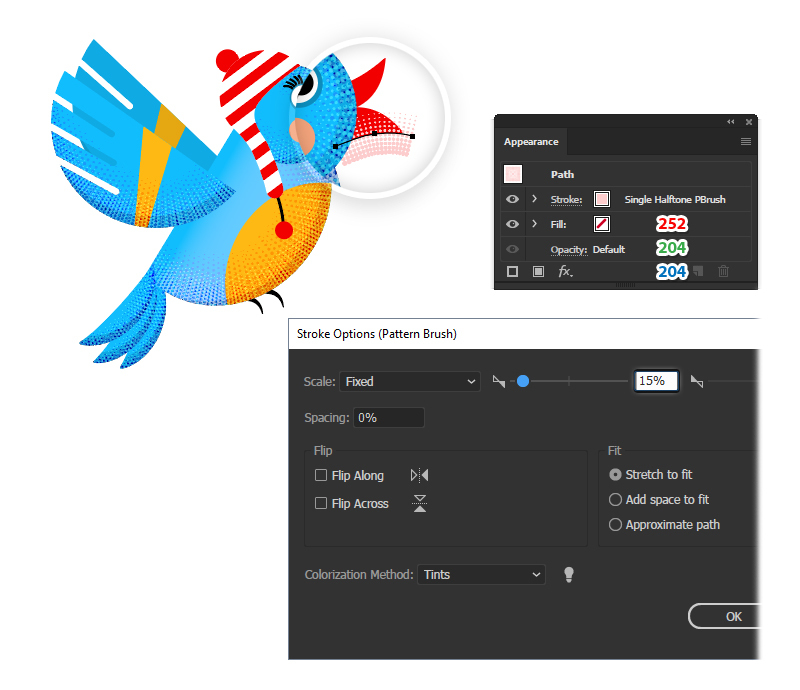 Remove all existing appearances; then select the stroked path along with this copy of the stripe and go to Object > Clipping Mask > Make (Control-7) (2). 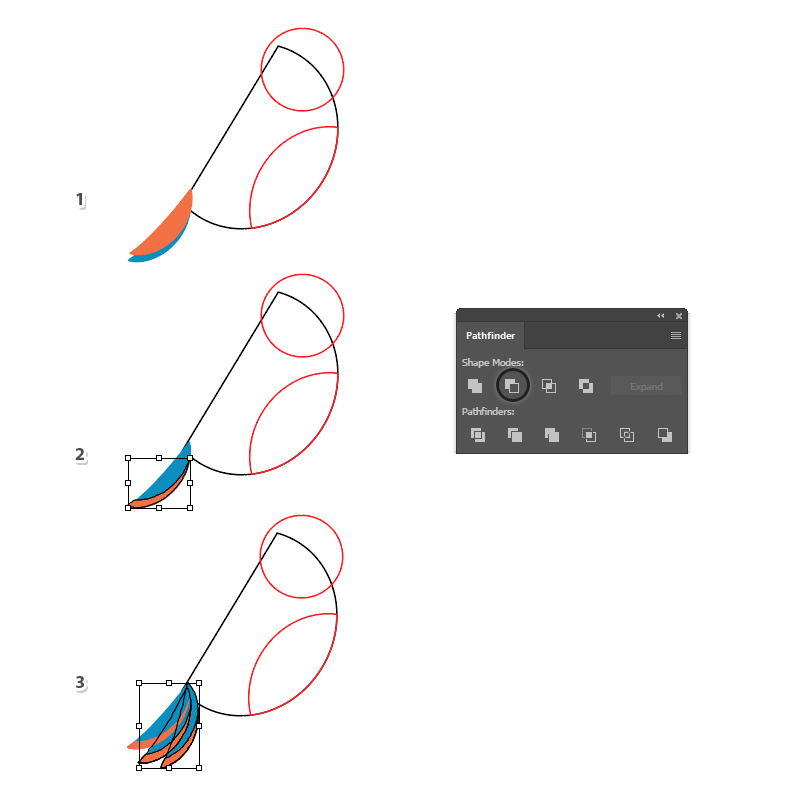 Take the Pen Tool (P) and draw a small V-like path on your artboard (1). Give it a 6 pt Stroke and use the Width Profile 6 in the Stroke panel (2). Go to Object > Expand Appearance to turn the stroke into a filled shape (3) and then drag it into the Brushes panel to save it as a New Scatter Brush. 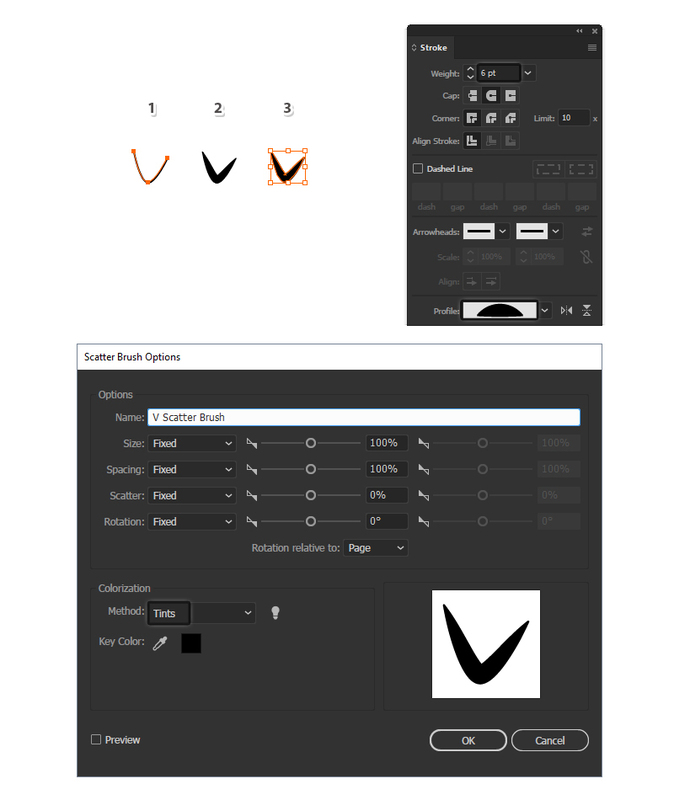 Type “V Scatter Brush” as the name and choose Tints as the Colorization Method. Hit OK. 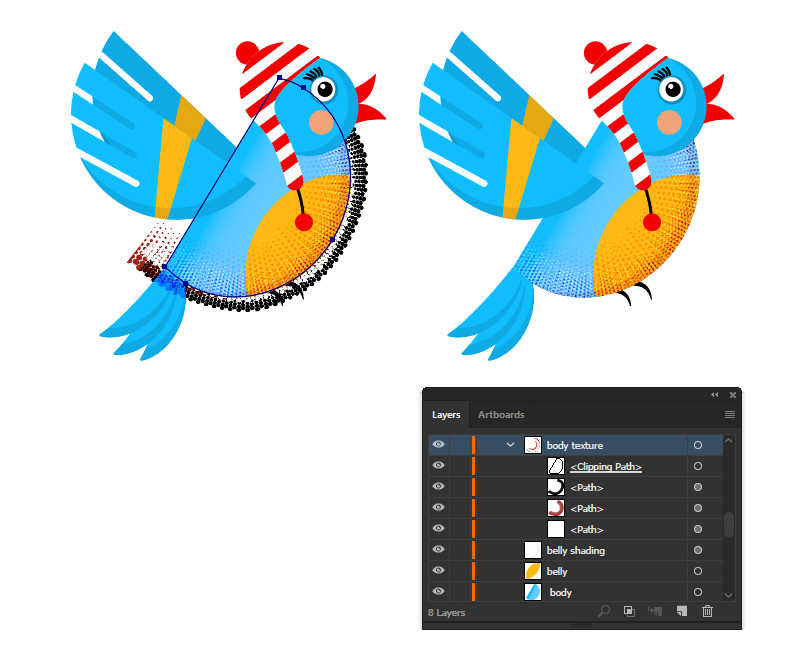 Still using the Pen Tool (P) draw a few curved paths on the belly of the bird. Give them a 1 pt white Stroke and use the “V Scatter Brush” that we just saved. 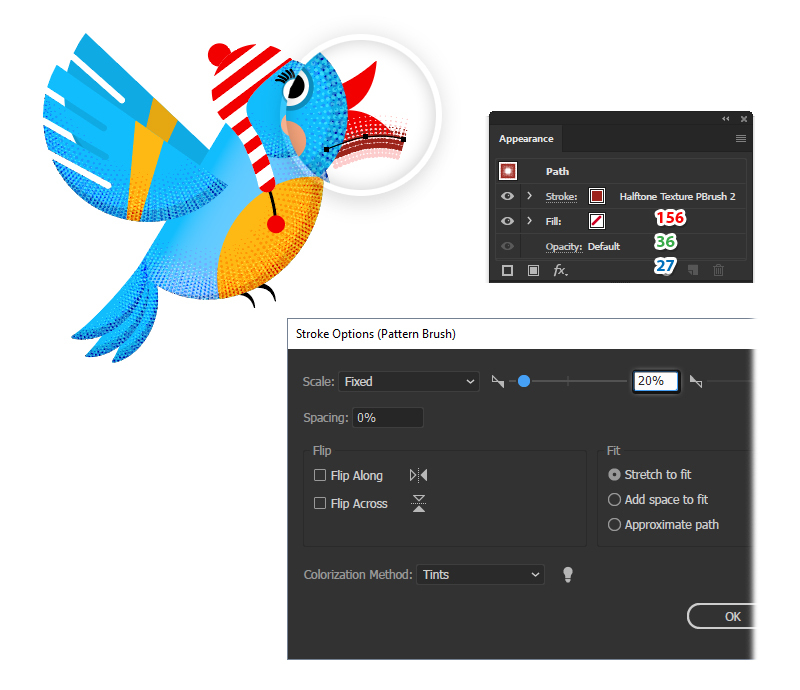 Open the Stroke Options window from the Appearance panel and change the settings as shown below. Draw four straight paths on the front wing and give them a 1 pt white Stroke using the “V Scatter Brush” again. In the Stroke Options window, change the settings as shown and hit OK. You will get small details on the wing as well. Use the Pen Tool (P) to draw five short oblique paths of different lengths. 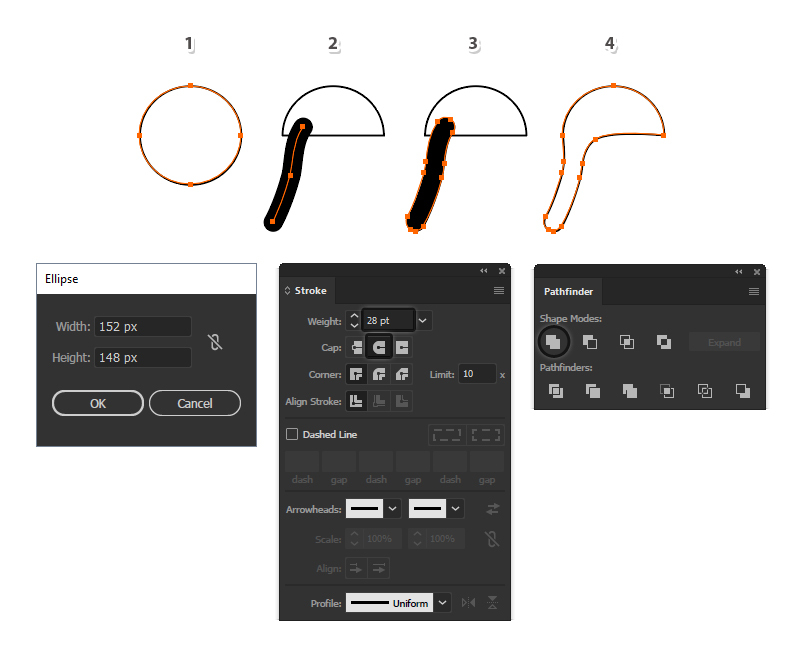 Give them a 0.1 pt black Stroke and use the Brush 3 Art Brush that you can find in the Brush Libraries Menu > Artistic > Artistic_Paintbrush. Go to Object > Expand Appearance to turn the strokes into filled shapes; then drag them into the Brushes panel to save a New Scatter Brush. Name the brush “Hatching Scatter Brush”, leave the settings as they are and hit OK.
To apply the newly saved brush, first draw two paths along the back of the bird. Give them a 1 pt blue Stroke and select the “Hatching Scatter Brush” from the Brushes panel. 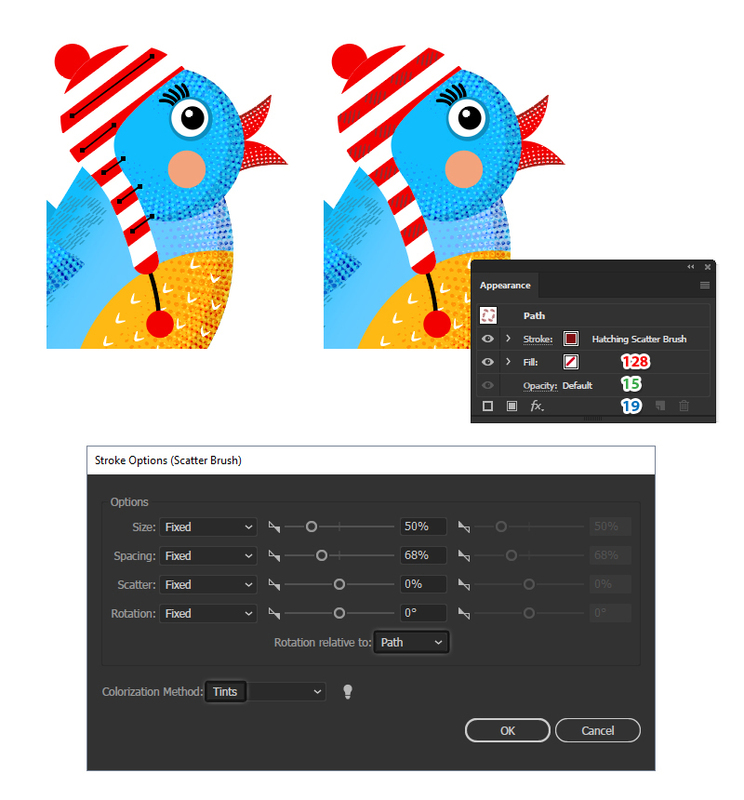 Open the Stroke Options window from the Appearance panel and change the settings as shown below to make the hatching details smaller and more dense. Set the Colorization Method to Tints so the brush strokes become blue as well instead of black. Hit OK after you are done. We are almost done. 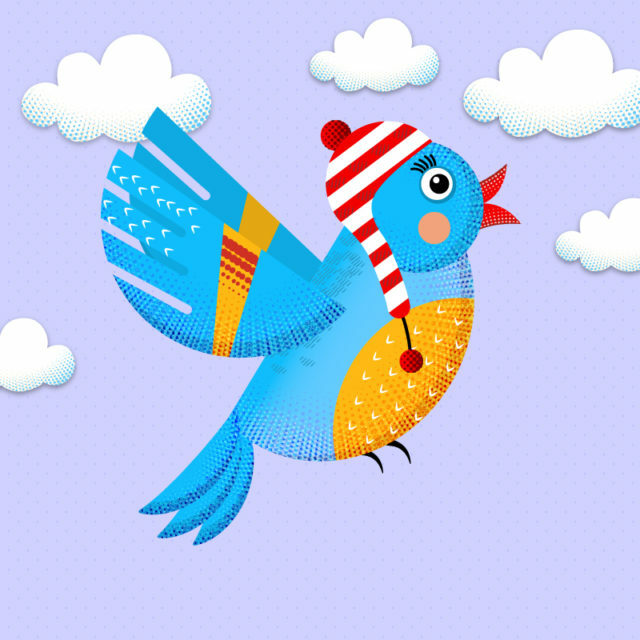 Focus on the hat of the bird and let’s add more details there. Use the Pen Tool (P) to draw straight paths along the red stripes. Give them a 1 pt dark red Stroke and use the “Hatching Scatter Brush” again. Change the settings in the Stroke Options window as shown. Select the pom on top of the hat and go to the Appearance panel. Add a New Fill above the existing one and use a basic white to black linear gradient. 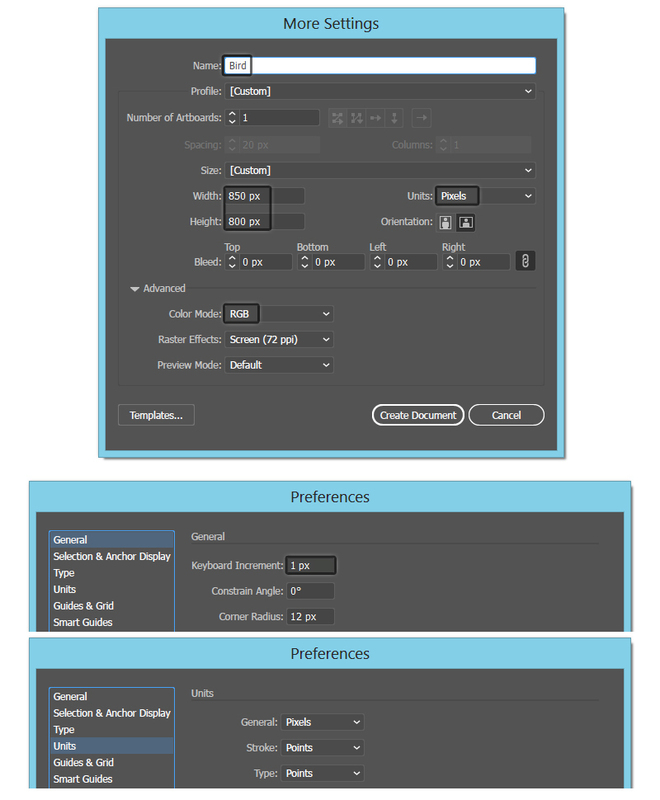 While this Fill attribute stays selected in the Appearance panel, go to Effect > Pixelate > Color Halftone. Apply a Radius of 4 px and set the Channels to 45 degrees Angle. Set the Blending Mode to Multiply and reduce the Opacity to 50%. 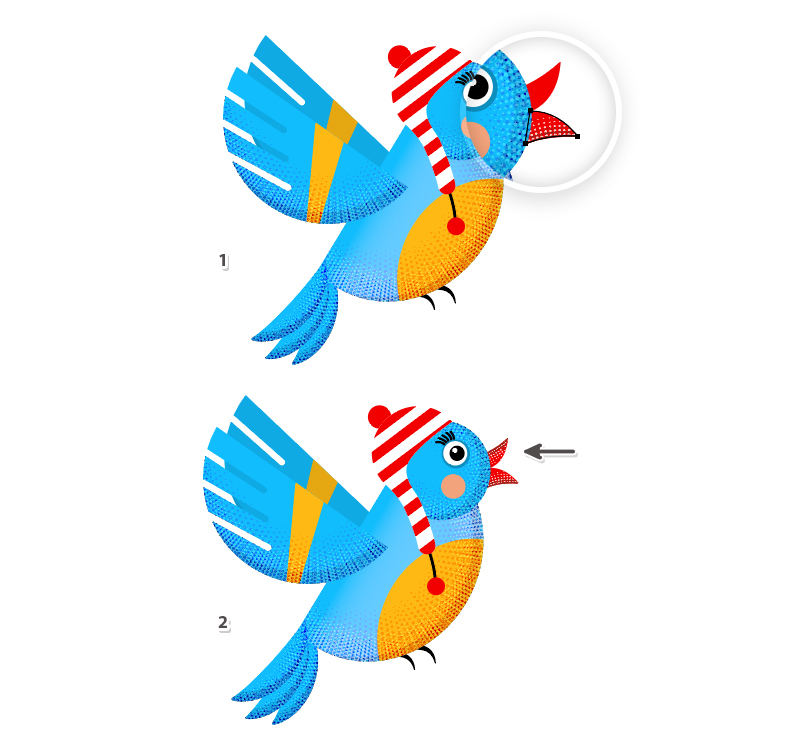 Repeat the previous step for the second pom and at this point this bird character is ready. 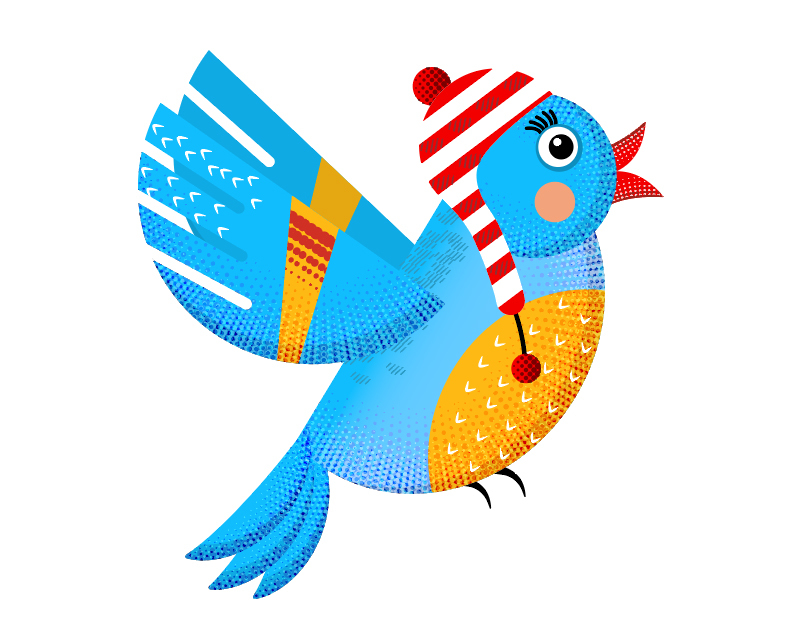 Here is the final image of textured bird character. I hope you enjoyed this tutorial and that you learned new techniques today.